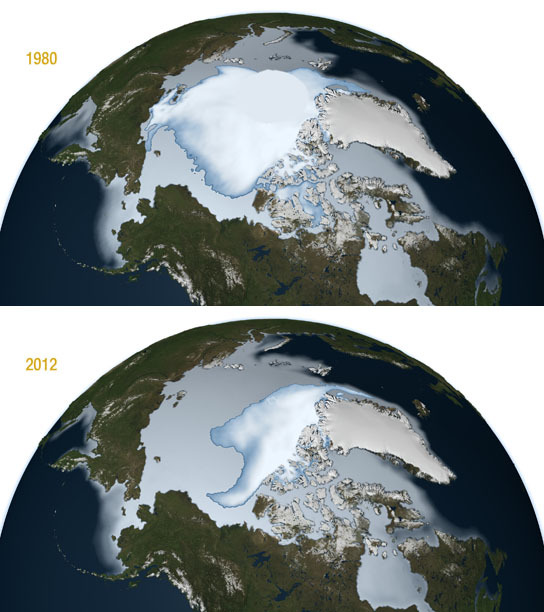 These photos illustrate how perennial sea ice has declined from 1980 to 2012. The bright white central mass shows the perennial sea ice while the larger light blue area shows the full extent of the winter sea ice including the average annual sea ice during the months of November, December and January. The data shown here were compiled by NASA senior research scientist Josefino Comiso from NASA's Nimbus-7 satellite and the U.S. Department of Defense's Defense Meteorological Satellite Program. Credit: NASA/Goddard Scientific Visualization Studio. Research complied from NASA’s Nimbus-7 satellite and the U.S. Department of Defense’s Defense Meteorological Satellite Program by senior research scientist Josefino Comiso shows how multi-year ice, ice that has made it through at least two summers, has diminished with each passing winter over the last three decades. GREENBELT, Maryland — A new NASA study revealed that the oldest and thickest Arctic sea ice is disappearing at a faster rate than the younger and thinner ice at the edges of the Arctic Ocean’s floating ice cap. The thicker ice, known as multi-year ice, survives through the cyclical summer melt season, when young ice that has formed over winter just as quickly melts again. The rapid disappearance of older ice makes Arctic sea ice even more vulnerable to further decline in the summer, said Joey Comiso, senior scientist at NASA Goddard Space Flight Center, Greenbelt, Maryland, and author of the study, which was recently published in Journal of Climate. Comiso found that perennial ice extent is shrinking at a rate of -12.2 percent per decade, while its area is declining at a rate of -13.5 percent per decade. These numbers indicate that the thickest ice, multi-year ice, is declining faster than the other perennial ice that surrounds it. As perennial ice retreated in the last three decades, it opened up new areas of the Arctic Ocean that could then be covered by seasonal ice in the winter. A larger volume of younger ice meant that a larger portion of it made it through the summer and was available to form second-year ice. This is likely the reason why the perennial ice cover, which includes second year ice, is not declining as rapidly as the multi-year ice cover, Comiso said. Younger ice, made from recently frozen ocean waters, is saltier than multi-year ice, which has had more time to drain its salts. The salt content in first- and second-year ice gives them different electrical properties than multi-year ice: In winter, when the surface of the sea ice is cold and dry, the microwave emissivity of multiyear ice is distinctly different from that of first- and second-year ice. Microwave radiometers on satellites pick up these differences in emissivity, which are observed as variations in brightness temperature for the different types of ice. The “brightness” data are used in an algorithm to discriminate multi-year ice from other types of ice. Be the first to comment on "NASA Study Reveals Multi-Year Ice Declining Faster than Perennial Ice that Surrounds It"